A woman decided to choose a weird habit that seems disgusting to some people. She shared a video when she was licking a toilet seat of an airplane. The weird woman disconcerted and generated repudiation in social networks after sharing the video on Twitter, for some strange reason, licking a toilet on a plane. 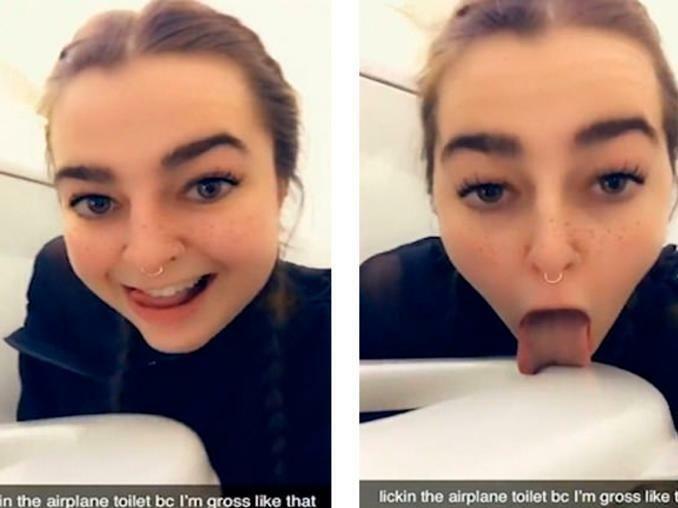 A woman with a user name “Grimiestt” on her Twitter account unleashed repudiation and outrage on social networks, after posting a video in which she is seen licking the seat of a toilet on a plane. The reason? It is not known yet, but it has left everyone baffled. “I’ve licked a lotta toilets in my day but this was the first that made my tongue go numb🚽✈️🧻🛩👅👅👅👅👅” reads the caption, she writes on her twitter handle, where she broadcast the video, which many have described as “disgusting”. As seen in the images, the woman appears sitting looking at the camera, when, suddenly, she bends down and begins to walk around the edge of the toilet, just where people sit. In her Twitter profile, the woman defines herself as an “18-year-old” sezx worker and has more than 28,000 followers. In addition, as seen in her publications, with some XXXXX contents. After the dissemination of the images, which already have more than six thousand shares and hundreds of reactions and comments, users expressed outrage and rejection of the woman’s daring action, warning her of the damage that the “disgusting” act may have caused her. “Your tongue has gone numb because you have contracted 1200 diseases at the same time,” said one of the Twitter users in the publication.